IN TROPICAL forests, as many as a thousand insects can live together on the same flower.Ã”Ã‡ÃªUsing molecular techniques, researchers have attempted to understand the interaction between communities of plant-eating insects that live in flowers and parasitic wasps (parasitoids) that lay eggs in the insect larvae. The results show that interactions between plants, flies and wasps happen across three levels of the food chain and create a multitude of tiny habitats, each with its own specialised resident insects. The research, which took place at Los Amigos Biological Station in Peruvian Amazon, looked at two species of the genus Gurania. These climbers are a relative of the cucumber. At the base of each flower of these plants, up to a thousand larvae from 14 species of the peacock fly belonging to genus BlepharoneuraÃ”Ã‡Ãªwere found. Most species were restricted to male or female flowers of their chosen plant. It was also found that wasps of three different genera had sneaked up to the unsuspecting peacock fly larvae and laid eggs inside them. These parasitic wasps develop inside the host insect. The peacock fly larva continues its life, munching the flower till it forms a puparium—its outer covering hardens to form a safety vault inside which the fly sleeps its way to adulthood. The parasitic wasp larva comes out of the egg, inside the puparium, and feeds on the fly larva, eventually killing it, and transforms into a fullgrown wasp. TheÃ”Ã‡ÃªresearchersÃ”Ã‡ÃªcollectedÃ”Ã‡Ãªabout 1,500 puparia from more than 3,600 flowers of the two species of Gurania. To identify the flies, the authors matched the sequence of a gene found in the mitochondria to existing databases. Using the physical appearance of the parasitic wasps, three different molecular diagnostic tools and genetic studies the authors could tease apart 18 parasitic wasp species. “We were totally amazed by this number. Blown away,” says Marty Condon, lead author of the study and associate professor of biology at Cornell College, US. The study was published in Science on March 14. Though the vines always grow intertwined with each other, more than 90 per cent of the fly species had very specific preferences—a single part of a single species. “Our studies over the past few years suggest that the flies’ fidelity to particular plants has been evolving for a long time—some of them have probably been eating the same plant species for six million years,” said Condon. Most of the parasitic wasps were equally choosy. Wasps of the genus Bellopius always preferred a single plant species. Further, they chose between male or female flowers. 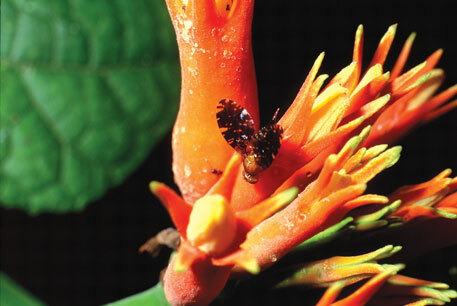 On the flower, even if there were 11 fly species, the parasitic wasps always laid its eggs on a specific species. All the flies exploit the same resource–the fleshy sepals of the flowers of the two vines. Given this, there is incredible diversity. The genetic data from the puparia showed that some wasps laid eggs on more than one species of fly, but survived only in one of them. In other words, wasps that laid eggs in the “wrong” fly had dead offsprings. “These flies probably choose different plants to escape the parasitoids. The parasitoids in turn specialise on a particular fly. This will give them an advantage because some flies are lethal to parasitoids,” says Condon. Flies try to get “enemy free” habitats while wasps are counter adapting, making the two locked in a kind of arms race. Both get diversified into many species because of each other. Condon speculates that genetic variation is the basis for these patterns—the flies choosing a particular plant, the parasitic wasps choosing a fly. Renee Borges from the Centre for Ecological Sciences at the Indian Institute of Science, Bengaluru, says that the environment around the parasitic wasp, while it is developing inside the puparium, helps it in reaching adulthood. “One can imagine that there is a chemical diversity within both the flies and parasitoids. Parasitoids may prefer a particular fly because they recognise it better. The chemical bouquet a parasitoid gets when inside its larvaÃ”Ã‡Ãªmay prompt it to hunt out a similar bouquet as an adult, helping it recognise the ‘right’ fly species,” she said.